Samir Flores Soberanes from central Morelos state worked with a community radio station and campaigned for environmental and human rights. Mexican media report that Mr Flores was shot twice in the head, and that his body was discovered in his home in Amilcingo, about 130km (80 miles) south of Mexico City. 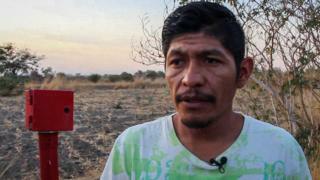 The project is due to put to a referendum this weekend - and environmental and human rights groups in the state believe that Mr Flores' death is linked to this vote. A group that he campaigned with, The People's Front in Defence of the Land and Water for the states of Morelos, Puebla and Tlaxcala (FPDTA), released a statement calling his killing "a political crime" and linking it directly to his outspoken opposition to the project. They called for the referendum to be postponed - but Mexico's President Andrés Manuel López Obrador said that while he condemned the killing, the vote would go ahead as planned. Officials have said that they have no reason to believe Mr Flores' killing was in any way linked to the project or the referendum. Morelos state prosecutor Uriel Carmona told Radio Fórmula that they think it was connected to "organised crime". "We do not have any evidence linking [the killing] to the referendum on the thermoelectric plant," he said. Mr Carmona also told the interviewer that there was "a message on a sign" left at the crime scene which indicated that the killing was gang-related. Meanwhile, Mexico's National Commission for Human Rights (CNDH) did not specifically point to a motive, but said officials had visited Mr Flores' family to provide "support and legal advice". It also urged the federal government to ensure "that this case will not go unpunished".